Liberty’s Lauren Spicer (10) beats Westerville Central’s Grace Stille (20) to the hoop during the first half of Tuesday’s Division I District Tournament opener in Westerville. Senior Lauren Spicer’s baseline jumper with 3:17 left gave the Olentangy Liberty girls basketball team the lead for good on its way to a 52-44 victory at Westerville Central in the first round of the Division I district tournament Tuesday night in Westerville. Spicer’s shot started the first two of seven straight points for the 23rd-seeded Patriots, who closed the game with a 12-4 run. Liberty held a 31-21 advantage when senior Kennedy Kashmiry went down with an apparent knee injury after she landed awkwardly going up for a layup in the third quarter. She left the game at the 4:47 mark of the third quarter and didn’t return. Peaks and valleys describes the Patriots (12-11) perfectly. Valleys ,or injuries in this case, are not a foreign concept for Liberty. Alexa Fisher late in the 2015-16 season, Breanna Yashko late last season and – most recently – Teegan Pifher, who was lost for the season with a knee injury in the third game. 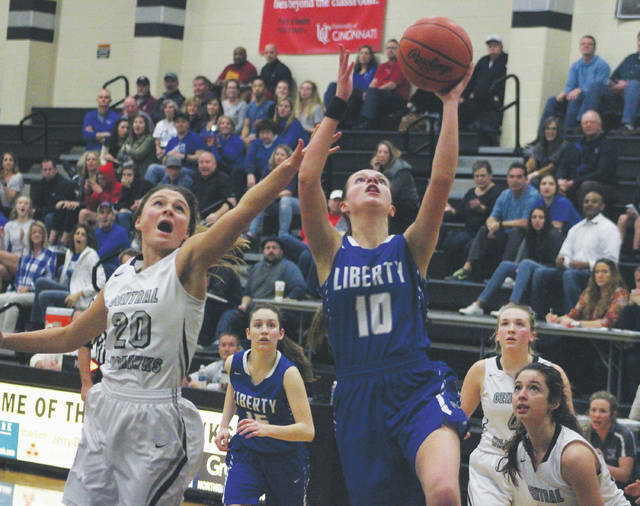 And like the regular season, Liberty struggled at times, but muddled through. Spicer’s play provided a peak. The senior role player came through with the go-ahead basket and finished with four points as well as a team-highs in rebounds (five) and blocks (three). Barna was another peak. She came off the bench in the second half, scoring eight of 10 points, including a pair of free throws down the stretch to help put the game out of reach. Gina Santangelo recovered from a couple of missed free throws early in the final frame to knock down three straight to go with three three-pointers and finished with a team-high 12 points. Kashmiry and Emma Humenay also hit three treys apiece for the Patriots and finished with 11 points apiece. Sydney Englehart found Kashmiry for her third triple on the possession prior to her injury to push the lead to 10. Barna turned a steal into a basket, pushing Liberty to its largest lead of the game at 33-21. But, Ashley Kramer and Casey George each knocked down threes and George followed with an and-one in a 12-2 Warhawk run that tied the game with 6:12 remaining. Santangelo answered the rally with a three-pointer off a Humenay feed to give Liberty the lead again. Santangelo found Barna for a basket underneath on the next possession to push the lead to five. George knocked down a three and Michayla Brenning found Brianna Smith to knot it up 40-40 for 11th-seeded Central. with 3:32 remaining. Kashmiry buried two threes sandwiched around a Barna basket to help Liberty take control in an 8-0 run in the first half. The Patriots held a 25-19 lead at the break. George scored 11 of her game-high 13 points in the final frame and Kramer added 11 points on the strength of three threes to lead the Warhawks (15-8), who had split the regular season series with the Patriots. Next up, Liberty travels to 15th-seeded New Albany in the second round Friday night at 7 p.m.
Ohio Wesleyan 89, Wabash 86, OT (NCAC Tournament first-round game).